A coroner has warned against giving babies "propped up" bottles of milk after a a four-month-old died when he was left to feed alone in his car seat. 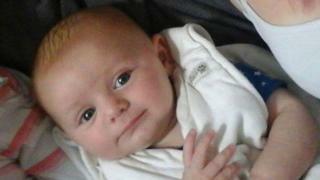 Alex Masters choked to death on his milk after godmother Claire Sawyer fell asleep on the sofa at her Lincoln flat. An inquest was told Miss Sawyer had given him a bottle of milk with a blanket propped underneath it. Coroner Stuart Fisher said although it was not illegal, babies feeding from a propped bottle should be supervised. The infant, from Gainsborough, died after being taken to Lincoln County Hospital on 3 October, 2015. Miss Sawyer, who was babysitting Alex overnight, was arrested on suspicion of murder but criminal charges were never brought because of a lack of evidence. Friday's inquest at Lincoln Cathedral Centre was told Miss Sawyer had a history of illegal drug taking but toxicology reports had shown she had not taken any on the night she was looking after Alex. She was questioned by the baby's mother Chloe Masters, 18 and claimed she fell asleep after giving him bottle of milk on the sofa. But the inquest heard she told a nurse that "she had killed a baby" after putting him in his car seat with a propped bottle of milk. Giving a narrative verdict, the coroner said Miss Sawyers was an "unreliable witness" and concluded that she had left the baby to feed in that way. A post-mortem examination found Alex had inhaled milk into his lungs. It also found he had two leg fractures that police concluded were non-accidental but were unable to determine how he got them because of the number of people who looked after him near the time of his death. Miss Masters told the hearing she would never have allowed Alex to stay with Miss Sawyer if she had known he was sleeping in a car seat.